The combination of the reflow profile and flux characteristics that produces outgassing before the solder becomes liquid (the red curve) will minimize voiding. My favorite candidate was trailing in the polls by only 1% in my state, but on primary day he lost by 5%. Why isn’t polling more accurate? Pity the pollsters. They have to predict what will happen by sampling a manageable number of people, say 1,000. This situation creates several challenges. The first is that their sample should represent the population as a whole. This challenge is not easy. They need to assure that the 1,000 people represent the population of the entire state. If they get an inappropriate number of old, young, wealthy, lower income, educated, less educated, etc. in these 1,000 people then their prediction will be off. As an example, let’s say that 45% of a state’s residents have a bachelor’s degree or higher, yet their sample has 60% with a bachelor’s degree or more. This difference will likely make their sample non-representative of the population as a whole and will skew the results. Let’s go back to your candidate, we will call him candidate A. It ends up that candidate A was supported by only 47.5% of the total population and his opponent, candidate B, by 52.5%, giving the difference of 5% that you mentioned. Let’s assume that the pollsters establish a good sample of 1,000 people that is very close to representing the state as a whole. It is unreasonable to expect that the 1,000 people polled would exactly have 47.5% or 475 supporting candidate A, due to statistical variation. 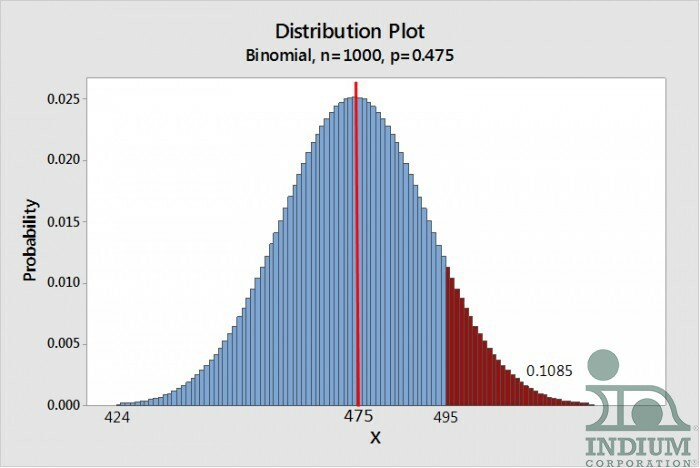 To show the likelihood of a number different than 475, we have to use the binomial distribution as seen in Figure 1 below. Note that there is about a 10% (0.1085 in the figure) chance that a population of 1,000 will have 495 or greater supporting candidate A. This uncertainty, added to the difficulty of establishing a perfect sample, makes polling error of 5% or so not uncommon. Figure 1. Note that, even though 475/1,000 is the most likely, if the larger population has 47.5% supporting candidate A, there is a 10% chance a sample of 1,000 could have 495 or greater favoring candidate A. Just as Patty finished her response, Pete came to her office door. “Hey Kiddo! Can we go over my thoughts on the voiding in BGA balls section on voiding for Mike Madigan?,” Pete asked cheerfully. “Sure. What do you have so far?” Patty asked. “I’m focusing on the importance of the reflow profile. Have you seen this graph (Figure 2 below)” Pete began. Figure 2. 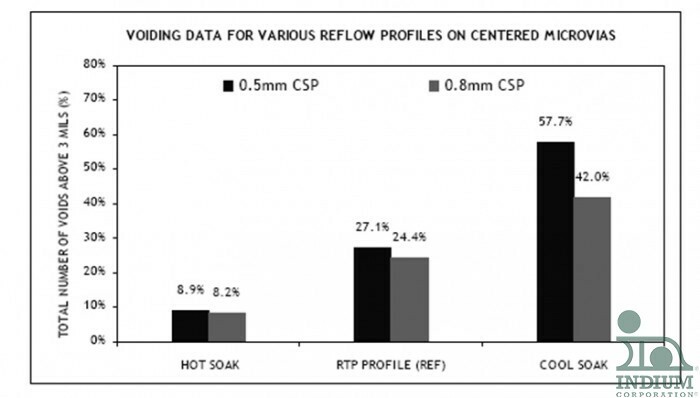 The hot soak profile produces the fewest voids in CSP and BGA balls. “Wow! That really shows the benefit of a hot soak profile over a cool soak profile. But, I am most surprised at how much benefit a hot soak profile has over a ramp-to-peak profile (RTP),” Patty commented. “Isn’t the timing of the higher temperatures important, too?” Patty asked. “My next point precisely. Look at this graph,” Pete said enthusiastically. Figure 3. The combination of the reflow profile and flux characteristics that produces outgassing before the solder becomes liquid (the red curve) will minimize voiding. 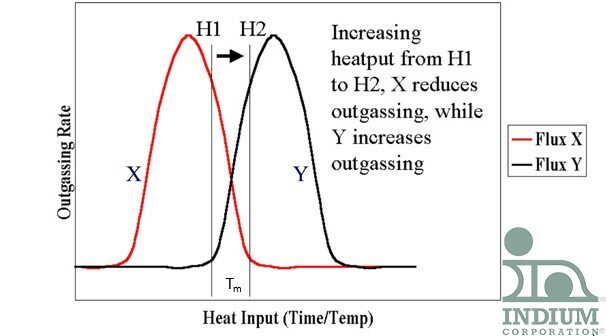 “The process engineer needs to assure that most of the flux is volatilized before the solder melts, as in the red curve, not as in the black curve where almost all of the flux is outgassing during the melting it the solder (Tm). This situation is assured by the correct combination of flux and reflow profile,” Pete said confidently. “Anything else, Professor Pete?” Patty asked. “It is really helpful to work with your solder paste supplier to obtain the red curve. They should be able to tell you what type of reflow profile and solder paste will most likely provide this kind of result,” Pete finished with a chuckle. And he added drolly. “Right ... Professor Pete." “Rob’s working on voiding on thermal pads for BTCs right?” Patty asked. “Yep. He said he will be ready in two days,” Pete answered. What will Robs plan be for minimizing voiding with BTCs? Will Patty be happy with it? Stayed tuned for the details. 80Au/20Sn - solder or braze? Excellent question.